BACKGROUND. Choledochotomy in patients with previous choledochotomy is technically difficult. Open surgery is usually the first choice in these patients. Laparoscopic choledochotomy seems to be feasible in expert hands. OBJECTIVES. Evaluate the safety and efficacy of laparoscopic choledochotomy in patients with previous open choledochotomy. PATIENTS & METHOD. 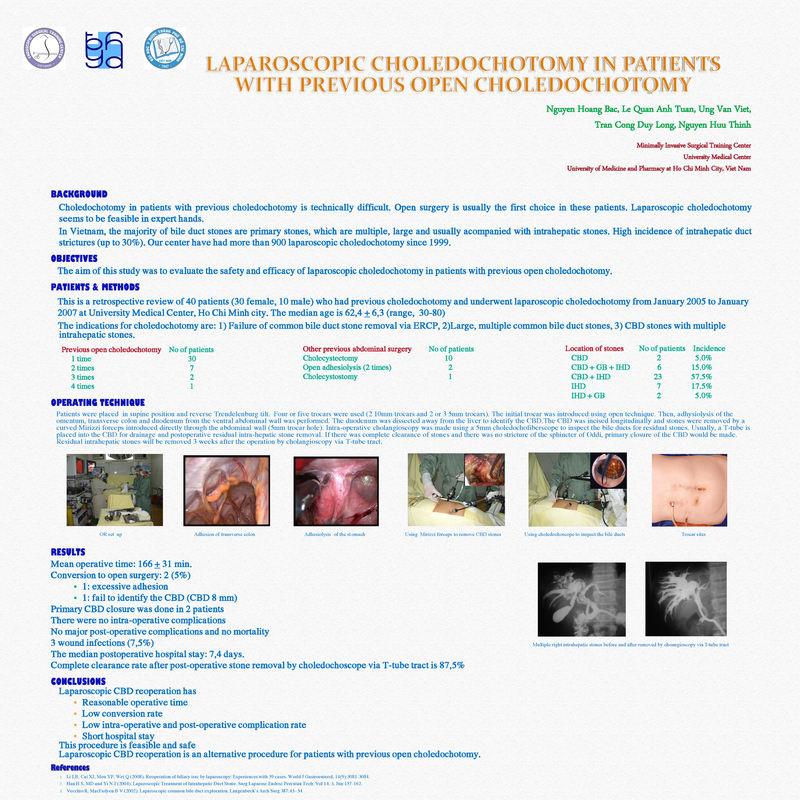 This is a retrospective study of 40 patients who had previous choledochotomy and underwent laparoscopic choledochotomy from January 2005 to January 2007 at University Medical Center, Ho Chi Minh city. The indication for choledochotomy is failure of common bile duct stone removal via ERCP or common bile duct stones with multiple intrahepatic stones. CONCLUSIONS. Laparoscopic choledochotomy is feasible, safe and effective in patients with previous open choledochotomy.